Queen Letizia is on a 4-day long cooperation visit to the Dominican Republic and the Republic of Haiti from May 20 to 23, to see first-hand projects carried out by Spanish cooperation in both countries. The visit began on Monday, 21 in the town of Monte Plata, where Spanish cooperation has underway a water distribution project in a very disadvantaged area. There Letizia made a tour of the location of the vats and the neighborhood of La Nueva Esperanza, where she received explanations by members of the neighborhood water committee. Her Majesty the Queen received explanations from the general coordinator of the Technical Office of Spanish Cooperation in the Dominican Republic, Blanca Yáñez. Letizia also visited the areas where the water distribution projects that are being carried out in Monte Plata. For this low-key yet a significant visit, Letizia chose a very professional look. She was wearing a blue blazer with white Massimo Dutti Capri trouser. Underneath the blazer Letizia was wearing a white multi-colour stripped top from Massimo Dutti. 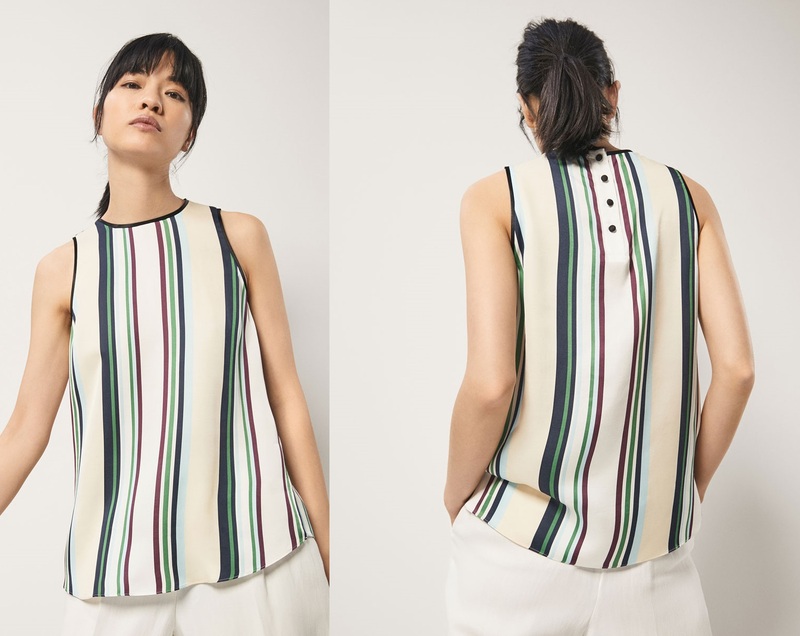 The sleeveless striped top features a straight cut, round neck, closure with four-button placket on the back with side openings. It is still available on online store for € 49.95. Today’s look also premiered a new pair of shoes today. She was wearing blue shoes with lace tie and net detailing. Letizia was carrying Hugo Boss blue suede bag that she premiered in 2013. And a pair of small diamond studs finished the look. Later in the day Queen Letizia will meet the President of the Republic, Danilo Medina and First Lady Cándida Montilla for a luncheon at the Presidential Palace in Santo Domingo.